It is the blazing summer of 1981 and Catherine is laid low by childhood illness. Stuck inside her family's sprawling Victorian mansion at the foot of a Highland mountain, she can only look down into the garden and observe the goings-on upon the lawn. Sam and Rosa, her elder teenage cousins, have come to spend the school holiday in this seemingly idyllic setting, and Catherine savours the brief visits Sam makes to her room. But when Rosa falls in love with Humberto, a young Spanish man camping in the grounds of the house, and Catherine witnesses a violent attack on Sam's beloved dog, the events of that summer take on a darker hue. 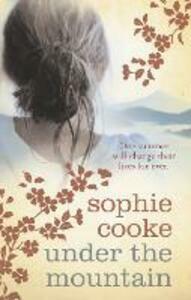 Under the Mountain is a fiercely intelligent and beautifully written novel about domestic politics and first loves, and in an unforgettable narrative that is both moving and haunting, Sophie Cooke powerfully exposes hidden inner lives and reveals the sometimes devastating consequences of love and the lies it can tell.